Theophany of our Lord is recounted in these scriptures: Matthew 3: 13-17; Mark 1:9-11; Luke 3:21-22, John 1:32-34, Psalm 2:7; Isaiah 42:1; 2 Peter 1:17. The Theophany or Epiphany is a major Feast Day in the liturgical calendar of the Orthodox Church. It is celebrated on January 6 (Julian calendar). 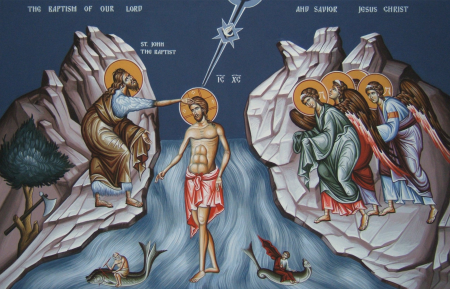 In the Theophany icon we see Christ standing in the Jordan River having St. John the Baptist on his left and angels on the right side assisting Christ. The Holy Trinity is manifested on this Feast Day, Christ was in the Jordan River, and the Holy Spirit was descending upon him, and God the Father spoke. “And Jesus, when he was baptized, went up straightway, out of the water: and lo, the heavens were opened unto him, and he saw the Spirit of God descending like a dove, and lighting upon him: And a voice from heaven, saying, this is my beloved Son, in whom I am well pleased” (Matthew 3:16-17). By descending into water, Christ sanctifies it, but immediately comes out for he had no need for cleansing. How do we prepare to Divine Liturgy? Very light breakfast, no lunch or a very light lunch if your health requires it, no supper until after Divine Liturgy. Theophany is the season for house blessings. If you would like your house blessed, please contact Fr. Hans. Deacon Elias Hamaty who served at our sister parish St. Paul’s passed away recently. May his memory be eternal. You can read Dn. Eli’s history and obituary on the Antiochian Archdiocese website. 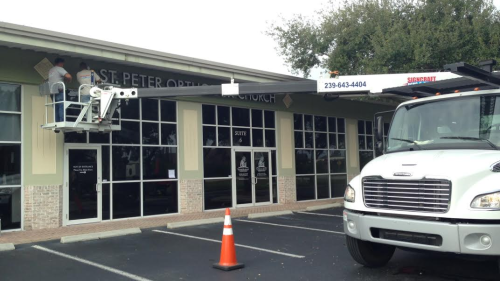 The sign is illuminated and the electricity will be hooked up in a week or two. Stewardship forms for 2015 are available in the back pocket of each chair or on the website. Your financial support of the Church is very important because it enables us to continue and grow. We are also instructed to support our Church in scripture. How much to give? How about the equivalent of one hour of work each week? May your new year be blessed. May God have mercy on us and bless us, may He shine the light of His countenance upon us, and have mercy on us. Please add to your prayers the servant of God John, brother of Pauline Poulos who is suffering from cancer. Please continue your prayers for Pat and Milam Evanoff. Milam is unable to make it to Church. O Lord, save Thy people and bless Thine inheritance. Unto Thee will I cry, O Lord my God. Timothy, my son, always be steady, endure suffering, do the work of an evangelist, fulfill your ministry. For I am already on the point of being sacrificed; the time of my departure has come. I have fought the good fight, I have finished the race, and I have kept the faith. Henceforth there is laid up for me the crown of righteousness, which the Lord, the righteous judge, will award to me on that Day, and not only to me but also to all who have loved His appearing.